I suspect that we will find out from Lin that she has some form of synesthesia about which she would like to write for the Loose Bloggers Consortium weekly posts. Otherwise, for the first time ever since the LBC began I am stumped good and proper with my bat well above the crease and back foot well out of the crease. I did not know that such a word or phenomenon existed and since I do not have any symptoms of it personally or know anyone with it, was blissfully ignorant. I can of course be facetious and say that I am a perfectly normal male who will respond to all kinds of stimulation, but I somehow feel that such reaction is not quite what Synesthesia is. My attempts at learning about it in the Wikipedia has confused me even more! I think that I will simply leave my readers with the message that I am sorry that I am unable to come up to my usual standards in this post and leave them to find out more about the topic from the other LBC bloggers and Wikipedia but particularly from Lin. This entry was posted in Blogging, Medicine, Writing and tagged Cricket/Stumped, Wikipedia. Bookmark the permalink. I’ve heard of it, but like you I have never experienced it! Since writing the post and Lin’s I have studied quite a bit more about it and find it fascinating. Indeed – she peaked my curiosity with this subject as well. Knowing she is a singer/composer I am most interested in hearing what she has to sway. s for me – well I’;m color blind so a synesthete I shall never be. 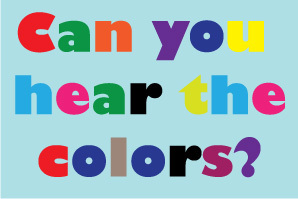 It would be interesting to me to hear about the methods you have invented to get around being color blind. Finagling around something opens a lot of doors to unusual ideas and free thinking, and often helps others in ways we don’t expect. Colour blind? That can be a blessing in some ways. Apparently there is an evolving species amongst us who are capable of this and so much more – i.e. tasting mathematical formulas. Now I will go read your comments. Yes, in the evolutionary scheme of things, humans have a long way to go to reach perfection. I think I understand. It is when you go into a restaurant that has “halal” posted on the front, but looks like a shack and plays country music, so you start smelling pork barbecue even though that isn’t what they are cooking. Looney, I hope my neighbourhood Mullah is not reading this comment. He might just issue a fatwa. i suppose it wouldn’t bother you. maybe a little like having a psychic gift and being so used to it … you don’t think it unusual. and rummy… i think you have NOTHING to apologize for! this was a fine post introducing it to us. hope you’re feeling better! i recommend drinking plenty of water and getting lots of healing hugs from chutki! It is day seven and I finally feel that I am on the mend and that I should be back to total normalcy in the next couple of days. Yes, I did take a lot of water and Chutki was never too far away from me. I hope that you will learn about it more just as I did out of curiosity. It is a fascinating subject. the first time i heard of it i was reminded of a friend who is a very good musician so i asked him if he had synaesthesia. I was fascinated and it was a compliment of sorts but he seemed offended! Why should he be? He may not have known what it is all about. Well, hats off to Lin for coming up with an original and new topic. Bless her….must go over and meet her. She is a fascinating personality. You will like what you see there.